One of our big challenges and frustrations of parenting in this modern world is managing our time. It is a constant struggle to try to find some balance between work, activities, school, screen time, etc. Like most parents, we constantly battle and negotiate with our children over their use of technology and the time spent with screens. Through the years, Jesse and I have often discussed our childhoods as farm kids. While there was always work to be done, we both agree that we had so much more time than our kids do today. Time to be outside playing, exploring, and just being kids. By moving out to the country, we hoped to give them the opportunity and inspiration to spend more time just being kids. Now, I won’t even pretend that we have been entirely successful at creating an idyllic and carefree childhood for our children. Our kids are involved in all sorts of activities that keep us running all over and like most families, we have tv’s, computers and video games. Our older two kids also now have cell phones with unlimited texting plans. Over the years, however, I do believe that our life here has allowed them to enjoy being kids in ways that would not have been possible in the city. 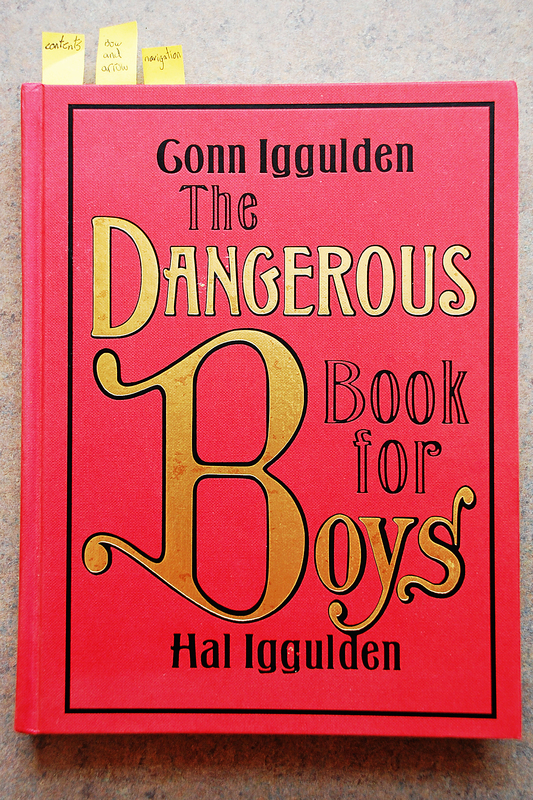 Our oldest son in particular was thrilled with these book and quickly started planning projects to work on, marking the important pages for later reference (finding these handwritten tags on the pages when I dug the books out to photograph made me smile). 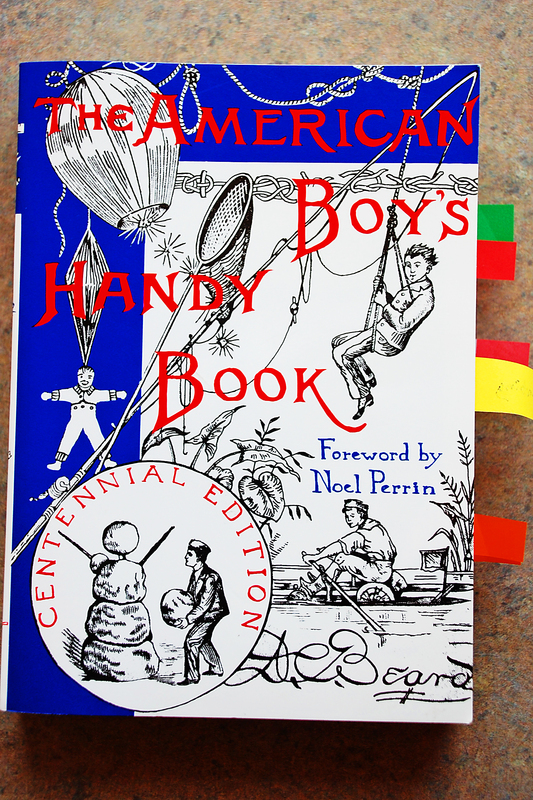 Over the winter he experimented with advice in Chapter XXVII from The American Boy’s Hand Book on snowball warfare. In the spring he attempted various animal traps and snares described in the book (I am happy to report he had no success). 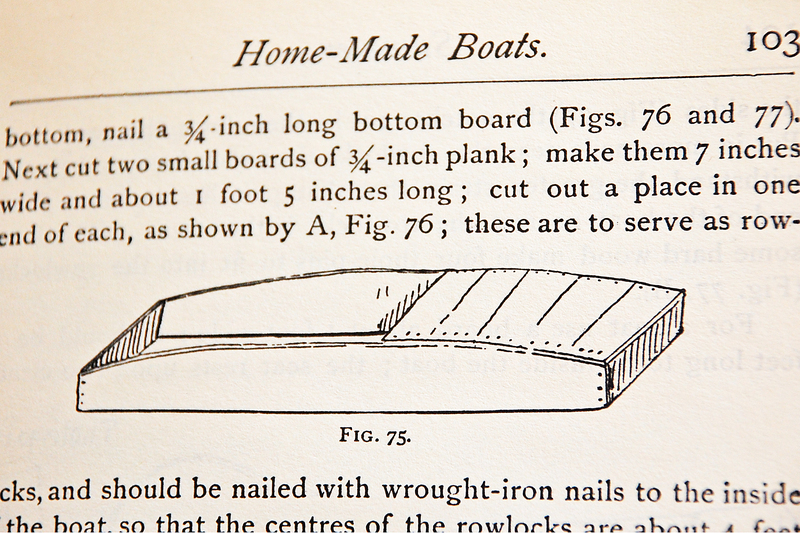 His biggest undertaking, however, was to construct a “scow boat” described in Chapter XII on home-made boats. 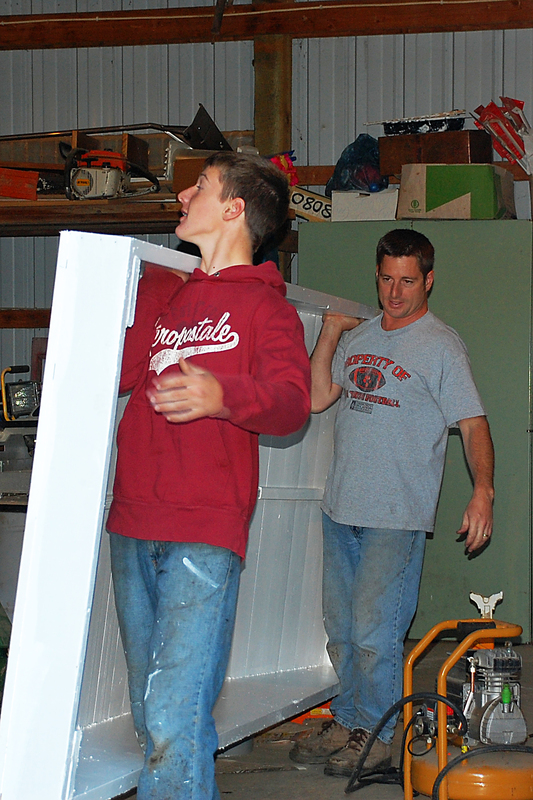 After conferring with his dad and modifying the plan somewhat, he started building his boat in the pole shed. His interest and enthusiasm in the project fluctuated through the summer. With some “encouragement” from his dad to finish the boat (i.e. get it out of his pole shed), he finally wrapped up the project in the fall. It was time to move the boat down to the river for a test run. It was extremely heavy and I was skeptical that the darn thing would float. They used the garden tractor to haul it down to the river. The other kids were curious about this boat after watching it being slowly constructed by their brother over the summer. Everyone came along to witness the scow boat’s maiden voyage. 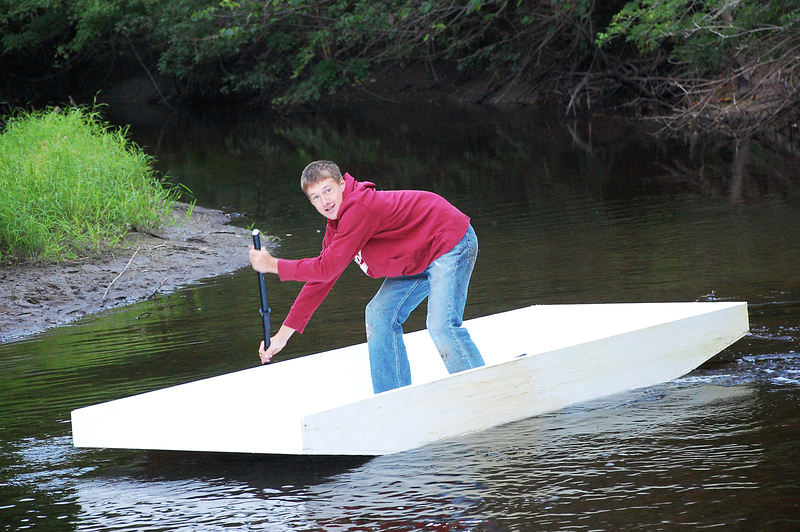 And I was wrong…although there were a few slow leaks, the home-made scow boat did float. 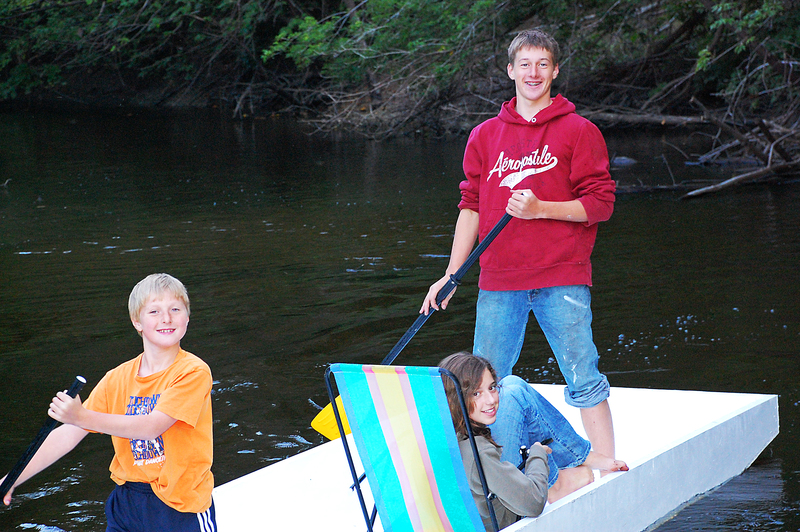 After confirming that it was seaworthy, the other two kids wanted a ride in the new boat. 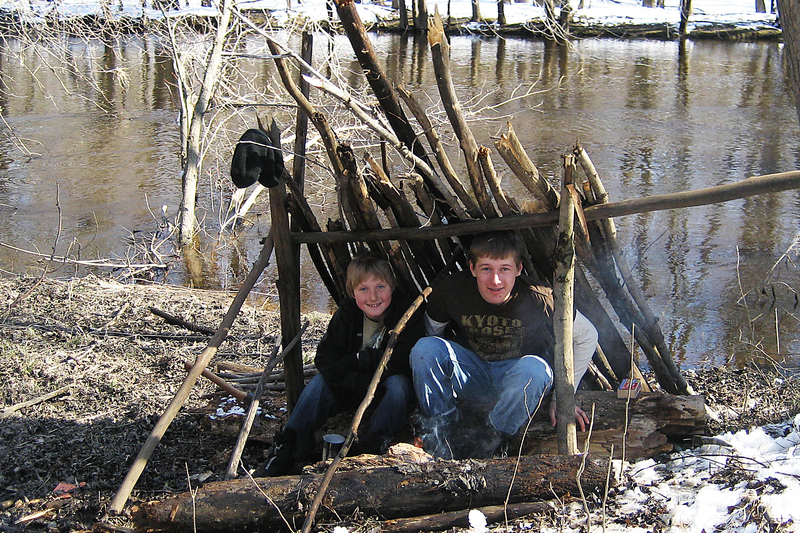 Another project inspired by the river, the woods, and perhaps a chapter on “How to Camp Without a Tent”, was this structure built by the boys a few years ago. It was one of those warm, thawing spring days and the kids were home from school and I was home from work The boys headed out towards the woods in the morning after a lecture from their “paranoid” mother on the perils of the fast-moving and cold river water. After they had been gone for a few hours, coming back to the house occasionally for various items (matches, a hatchet, a can opener, a can of beans, etc. ), I decided to check out what they were up to. I found them underneath this little structure, warming up a can of beans over a small fire they had built. After forcing them to pose for a picture, I left them alone to be boys in the wilderness. As I walked back towards the house with a light heart and a huge smile on my face, I thought to myself that instead of watching tv or playing video games, this is exactly the kind of thing that boys should be doing on a warm spring day.